I was lucky enough to be given the Miss Dior Eau de Parfum and perfumed body moisturiser for my birthday this year. I have always wanted to pick up a bottle, but with such a high price tag, I always hoped that one day it might be a present. I absolutely love them. I’ve never used a perfume branded body moisturiser before, as again they are always so pricey, but after using this one, I will definitely be buying the matching moisturiser to my perfumes in the future. Before spritzing myself with the perfume, for special occasions I might add, I apply the moisturiser to my arms, neck and cleavage. This means that the beautiful perfume smell is intensified and you constantly smell incredible. The moisturiser is the softest, silkiest fluid I have ever tipped out of a bottle as well, it is so special. Your arms afterwards feel so smooth, you can definitely tell the fantastic quality. 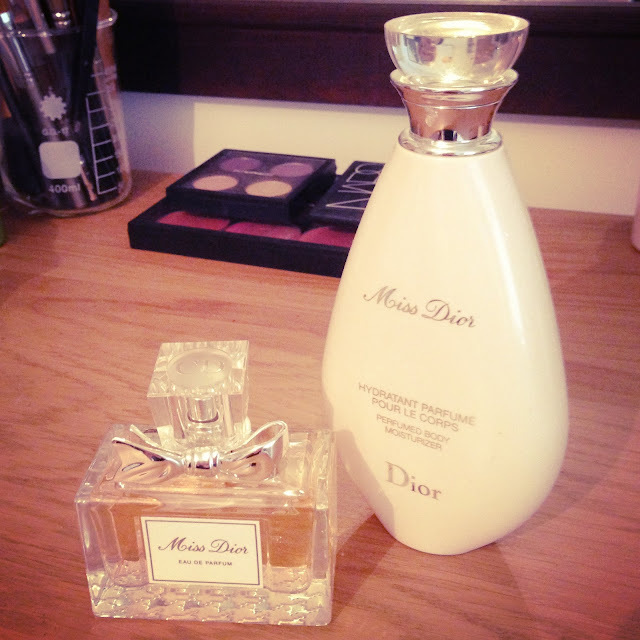 If you haven’t smelled the Miss Dior Eau De Parfum before, it is a really sweet and girly scent I feel. Very similar to Chanel Coco Mademoiselle, it is quite strong and recognisable, yet it still remains quite light and feminine. Apparently, the smell is Italian mandarin, Egyptian Jasmine and Indonesian Patchouli if you can imagine such a mixture. Anyway, it is gorgeous and one of those scents that people can spot a mile away. If you are debating whether to give it a go, you should buy it straight away, you will love it.